Yup, I know, I know ... I'm getting slightly ahead of myself here, looking at bags to store my micro 4/3 gear before the gear even arrives ... LOL. I already have a full set of Lowepro toploader, belt, harness, vest, lens cases and bags, but they're all pretty bulky, so I have set out to find a more compact bag that just fits everything nicely. So far, I have narrowed it down to the Crumpler 5 MDH, Think Tank Urban Disguise 20 and the Lowepro Apex 140 AW. 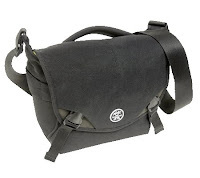 Out of these three, I think the Crumpler 5 MDH is my first choice at the moment. I like how it looks like a normal sling bag on the outside.